The island is divided between the Republic of Ireland, which covers just under five-sixths of the island, and Northern Ireland, a part of the United Kingdom, which covers the remainder and is located in the northeast of the island. The population of Ireland is approximately 6.2 million people. Just under 4.5 million live in the Republic of Ireland and just under 1.8 million live in Northern Ireland. 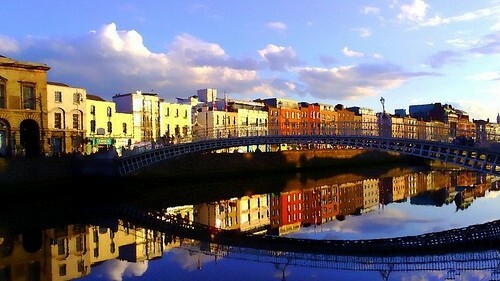 In 2007 Ireland enjoyed enviable economic growth, and became one of the wealthiest countries in Europe - earning the affectionate nickname of Celtic Tiger. The nation became a sudden expat hot spot and a global player. However, as a result of the worldwide recession, Ireland’s property bubble went pop and its economic collapse was more drastic than that of many other European nations. This effected thousands of people who were working in Ireland and is still causing major problems in the employment sector. Ireland's unemployment is now at a staggering 14.4%. Nonetheless, left over from the boom is a wave of multinational companies that relocated to the island nation. Lured by low business taxes, EU status and comparatively low wages, many American companies set up European hubs and even more contributed through direct investment. Many expats are surprised to learn that Ireland has stronger economic ties to the US than the UK, with nearly 500 US companies located there. Many American and British expats headed to Ireland during the peak period of economic growth, and scores still remain. Expats considering moving to Ireland in the immediate future should be aware that they may have to fight through high unemployment rates and a competitive market. However, grey forecasts, economic or otherwise, still don’t cloud a nation that values a relaxed way of life and an impressive natural aesthetic. Despite the clout the Irish have around the world, people forget the island is home to a mere four million people, about half as many as New York City proper. Thus, the charming and resilient culture and the strong ties to overseas companies continue to make Ireland a welcome job posting and expat destination. We have thousands of local members waiting to answer your questions on living and working in Ireland. Join Worky or Login to Join the Discussion. Hey, my name is Edita I have 4 years experience in project managment, I moved to Ireland Atlove few weeks ago and trying to find any job here, maybe someone knowns somethink? my name is Neilson, i have double citzenship Brazilian/Italian, I am currently living in London. I am Oracle OCP 11g certified, strong background working with Database Administration, Performance & Tuning, Oracle/DB2, working with large scales databases, RAC, HA, with high volume transactions and high criticality. I am looking for a position in Ireland. my name is dee and i have 10 yrs experience as a phlebotomist. i am looking to move to ireland. does anyone know of any jobs? I am a freelance photographer living currently in Argentina, I am an Italian-Argentinian citizen (Italian passport), without problems to relocate inmediately. Im looking a photograhper job or similar. I am Prem from India, Have 6 years of experience in Electronics Industry, Looking for a Job in Ireland. anyone please help. If you're applying from outside Canada it's possible that they're not contacting you because there's a pool of people with the same or similar qualifications already there. Canadian employment rules are structured so that you can bring anyone over from anywhere, IF you can demonstrate that you advertised a particular job for a minimum amount of time and got no qualified applicants from within canada. Your experience in the plumbing industry will benefit you, although it is difficult when there are many other native plumbers in Canada looking for work too? If you're eligible for a work abroad program wherever you are, you'd be guaranteed the work visa, and therefore, would be relatively easy to hire. Check out this great link regarding how to go about getting a visa in Ireland. There is plenty of information to get you familiar with the way it works. Check the FAS website. They are looking for 40 plumbers.